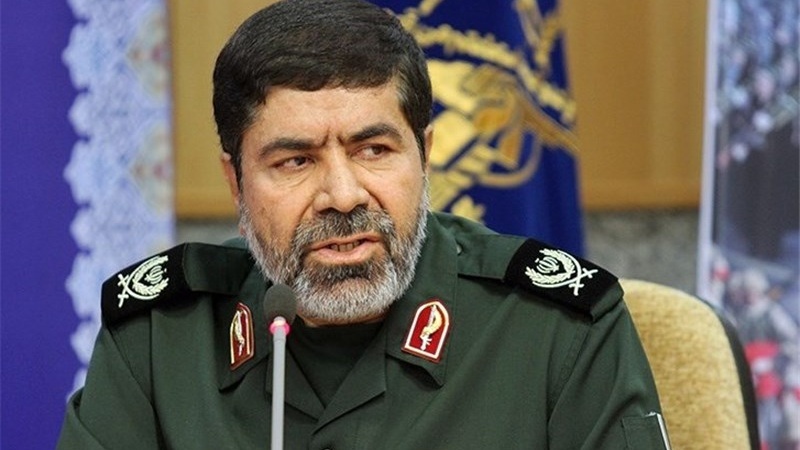 The Islamic Revolution Guards Corps spokesman vowed revenge for a recent terrorist attack on an IRGC border post in Iran’s western province of Kurdistan. Warning the sponsors of terrorism against the IRGC’s “iron fist”, IRGC Spokesperson General Ramezan Sharif ,highlighted the force's readiness for decisive action against the moves upsetting security along the Iranian borders. He also described the high turnout of people in the funeral of the servicemen martyred in the Friday night’s terrorists attack as a testimony to the failure of enemies to create division between the Iranian people and the organizations protecting the Islamic Republic. While the terrorists benefitting support from the US and its regional and trans-regional allies are coming to an end, “we warn the foreign intelligence services and organizations that a harsh revenge for the recent incident (attack on the border post) is high on the agenda” of the IRGC forces, the general added. He also cautioned the sponsors of anti-Iran terrorist and criminal groups that they will have to face the IRGC’s “iron fist” and “pay direct costs” if they keep up their plots against Iran. On Friday night, culprits and anti-revolutionary terrorists affiliated with the US launched a raid on a border post of the IRGC Ground Force’s Hamzeh Seyed al-Shohada Base in the village of Dari in Marivan District, west of Iran, killing 11 troops, according to the IRGC.